Parents and treating doctors are expected to trust the CDC declaration without independent confirmation. That’s because documents about vaccine safety and efficacy test results are secret. Independent scientists are prevented from verifying that the “safe and effective” claim is true. Parents are understandably concerned about the ever increasing, high number of children affected by developmental neurological disorders, said to be about 15% of children. Some have described it as a “silent pandemic” that includes learning disability, sensory deficits, and developmental delays and autism. CDC first began to record the autism prevalence data in 2000. At that time, the number of children diagnosed with autism spectrum disorder (ASD) was one in 150 children. In 2007, one in 86 children was diagnosed. * HiB – Improved Hib conjugate vaccine added in 1988. *DTaP – Additional dose at younger age added around 1990. *HiB – Three additional doses added to schedule in 1991. *Hep B – Three doses – Added to childhood schedule in 1992. Can we in good conscience ignore the evidence that for a minority of children CDC’s Childhood Vaccination Schedule poses serious risks of harm? 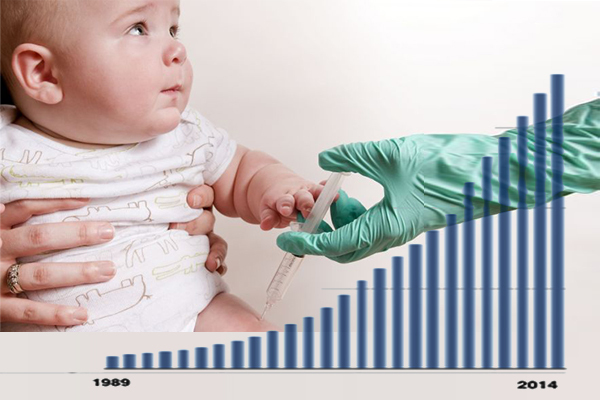 Clearly, public health authorities have a public responsibility to obtain scientific data from tests evaluating the combined effect of toxic components (called synergistic toxicity studies) of all the combinations of vaccines that millions of infants are likely to receive – including the timing at which vaccines are given. The fact is that CDC has failed to initiate such studies. Indeed, the safety of the cumulative effect of CDC’s childhood vaccination schedule – with its multiple vaccines simultaneously administered – has never undergone scientific tests. “No field trials have compared the effectiveness and harms of all vaccines used according to various schedules listed in the recent BMJ infographic.6 12 The time for such studies is ethically and logistically past. The full evidence base to make such complex decisions as the timing of each vaccination, in conjunction with developmental issues and the effect each vaccine has on the response to the others, is seldom fully available when vaccination schedules are devised…despite concerns about overloading infants’ immune systems we can find no evidence of harm. When did Merck know about the safety hazards of thimerosal, the mercury disinfectant its widely used in its vaccines? “6-month-old children who received their shots on schedule would get a mercury dose up to 87 times higher than guidelines for the maximum daily consumption of mercury from fish. When viewed in this way, the mercury load appears rather large. “It has been suggested that the measles-mumps-rubella (MMR) vaccine may cause autism. If true, this could jeopardize the MMR vaccine program in children. The debate was initiated by research in Britain by Wakefield. In addition, Uhlmann recently published a study where they found measles in the gut in patients with developmental disorders but not I controls. The ferocity and underhanded tactics used by vaccine zealots in the autism debate are akin to the battle waged by the Tobacco industry in its long denial that cigarettes cause lung cancer. However, the medical establishment did not promote or defend tobacco. Most people do know that in 1986, in the wake of thousands of vaccine injury lawsuits, congress eliminated liability from vaccine manufacturers and established the National Vaccine Injury Compensation Program (NAVIC) with its own special vaccine court to handle vaccine-related injuries – and to pay compensation. After many years of vehement denial by the US government; by vaccine promoters in industry; and by the medical profession, the media, the scientific literature – that there is no evidence of a link between vaccines with the onset of autism, in November 2008, the US government conceded in the special US vaccine court that a causal effect of autism features, triggered by vaccines had been demonstrated in one child. The government agreed to pay millions of dollars in compensation. Bailey Banks, the government conceded (2007) developed Pervasive Developmental Disorder (PDD), “a subthreshold” condition with features of autism caused by the MMR vaccine. Ryan Mojabi, the government conceded (2012) had suffered an MMR vaccine encephalopathy. “Well, you know, I don’t have all the facts because I still haven’t been able to review the case files myself. But my understanding is that the child has a — what we think is a rare mitochondrial disorder. And children that have this disease, anything that stresses them creates a situation where their cells just can’t make enough energy to keep their brains functioning normally. Now, we all know that vaccines can occasionally cause fevers in kids. 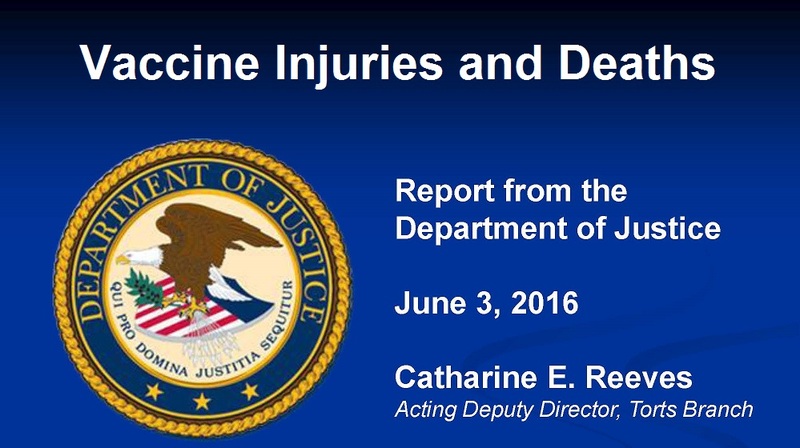 The Vaccine Adverse Event Reporting System is an important post-marketing safety surveillance tool. The study confirmed that thousands of VAERS reports are of serious adverse effects resulting in infant hospitalizations and deaths. The reviewers limited their analysis to 38,800 such infants in their first year of life. “Our findings show a positive correlation between the number of vaccine doses administered and the percentage of hospitalizations and deaths. Infants who receive several vaccines concurrently, as recommended by CDC, are significantly more likely to be hospitalized or die when compared with infants who receive fewer vaccines simultaneously. It also showed that reported adverse effects were more likely to lead to hospitalization or death in younger infants. Of the 38,801 VAERS reports that we analyzed, 969 infants received two vaccine doses prior to the adverse event and 107 of those infants were hospitalized: a hospitalization rate of 11%.The hospitalization rate increased linearly from 11.0% for two doses to 23.5% for eight doses. 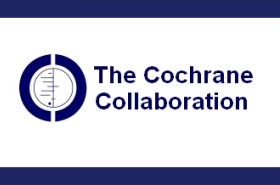 The Cochrane reviewers determined that none of the studies upon which the safety of the MMR vaccine rests met the Cochrane Collaboration’s methodological criteria. * eight studies had a High risk of bias. * All studies suffered from a lack of adequate description of exposure (vaccine content and schedules). * Another recurring problem was the failure of any study to provide descriptions of all outcomes monitored. In addition, there was an overall attrition rate of 33%. In the absence of reliable evidence to support the claimed safety of the MMR vaccine, the Cochrane reviewers resorted to circular reasoning by suggesting that the safety and effectiveness of the MMR vaccine is borne out by “current policies of mass immunisation.” If the evidence for Merck’s MMR vaccine safety rests on its widespread use, then by that reasoning the Cochrane would have concluded that the company’s widely used painkiller, Vioxx, was safe. CDC officials have shown a lack of interest in developing screening tools to identify individuals who may be “at risk” of catastrophic vaccine injury; and NIH fails to fund that avenue of research. As for the high profile journal gatekeepers of “evidence-based medicine,” they have refused to publish critiques of childhood vaccine mandates; and pretend that a body of research suggesting a link between the onset of regressive autism and intestinal inflammation does not exist. Dr. Peter Aaby, Director of the Bandim Health Project, a demographic surveillance system (in Guinea-Bissau, West Africa), is affiliated with the Statens Serum Institute. In 1991, Dr. Aaby identified an unexpected finding; non-specific vaccine effects which go beyond the specific protective effects of the targeted disease. These non-specific effects can be beneficial or harmful Dr. Aaby has conducted a series of comparative “natural studies” of vaccinated and unvaccinated children. His most recent study, published in 2017, compared the mortality of children who were vaccinated with the diphtheria, tetanus, pertussis (DTP) vaccine and the oral polio vaccine (OPV) between 3 and 5 months, with those who were unvaccinated. When DTP and OPV were introduced in Guinea-Bissau in 1981, allocation by birthday resulted in a natural experiment of being vaccinated early or late. Between 3 and 5 months of age, children who received DTP and OPV early had 5-fold higher mortality than still unvaccinated children. In the only two studies of the introduction of DTP and OPV, co-administration of OPV with DTP may have reduced the negative effects of DTP. 5 Conclusions: DTP was associated with 5-fold higher mortality than being unvaccinated. No prospective study has shown beneficial survival effects of DTP. Unfortunately, DTP is the most widely used vaccine, and the proportion who receives DTP3 is used globally as an indicator of the performance of national vaccination programs. Ultimately, whether people believe that vaccines cause autism or that the theory is all junk science depends largely on which researchers people feel are most trustworthy. The appeal to “authority” is no longer persuasive, given the betrayal of trust. Posted by Vera Sharav | Friday, May 12, 2017 |	Categorized Unsafe Vaccines, Current Controversies | Tagged Autism, BMJ, WHO, 600 vaccine candidates, CDC vaccine schedule, safety untested, 1 in 45 US children, "changepoint" year 1988, vaccine harms, secret data, Merck knew thimerosal harm, NAVIC, VAERS database, independent review, Cochrane MMR, "largely inadequate". vaccine court cases, CDC disregards harm, Dr. Peter Aaby, DTP vaccine, Myron Levin, ME McDonald, JF Pau, Dr. Maurice Hilleman, Dr. Vittorio Demicheli, Dr. Tom Jefferson Bookmark the permalink.